Signature ingredient: With antioxidants from vitamin E, extract of jasmine, and a slew of mineral and moisture-rich emollients, this cream provides deep penetating protection for dry skin. Product description: Enriched with jasmine and vitamin E, this luxurious moisture cream works day and night to replenish essential nutrients and neutralize free radicals for a soft, smooth, radiant complexion. 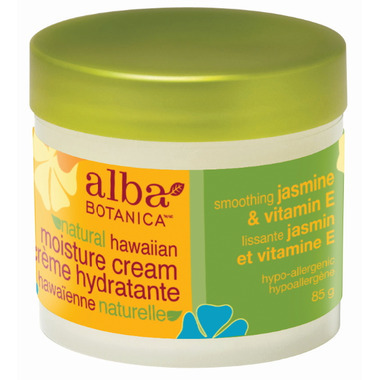 Features and benefits: Dry, stressed skin craves vitamin E to help repair itself, and this moisture cream delivers. With skin-saving oils from almond, jojoba and borage, plus tropical nut oils for intense nourishment deep within your skin, this is essential stuff for a harassed complexion. Who should use this product? This is a superb daily moisture cream for dry, mature skin and a perfect night cream for all skin types. Directions for use: Apply to clean face and neck. Avoid contact with eyes. Ingredients: Purified water, organic helianthus annuus (sunflower) oil, vegetable glycerin, glyceryl stearate, octyl palmitate, organic aloe barbadensis leaf juice, tromethamine stearate, cetyl alcohol, glyceryl monolaurate, extracts of centella asiatica (gotu kola), chamomilla recutita (chamomile) and jasminum officinale, tocopherol and tocopheryl acetate (vitamin E), organic oils of prunus amygdalus dulcis (sweet almond), borago officinalis (borage) and simmondsia chinensis (jojoba), allantoin, panthenol (pro-vitamin B5), macadamia ternifolia oil and aleurites moluccana (kukui) nut oil, zingiber zerumbet (awaphui) and carica papaya extracts, dimethicone, xanthan gum, ethylhexylglycerin, phenoxyethanol and fragrance. A really nice moisturizer but the scent is a little too perfume-y. I have been used quite a few different brands of face cream for 30 years. This is the best face cream I have ever use. Will be sure to keep the seller in mind for future purchases of a similar nature. Thanks a lot. Highly Recommended! This is my favorite cream! I use it every day, summer and winter. It's not quite as strong as I need in the winter, but I just add other products for extra moisture. It smells good and best of all my sensitive skin does not react to it at all! Lovely scent, light moisturizer. Feels great on the skin! Highly recommended. Lovely scent and great as a day cream, however too light for the winter months and/or night time use. I picked this up for use at night when I was repairing my dehydrated, oily skin. It's rich and can be greasy if you apply too much, so for me it was better as a night cream. The ingredients list is amazing, and includes sunflower oil which is wonderful for acne prone skin due to its high linoleic acid content. Using it as a night cream and love it. You do not need to use too much and it absorbs really quickly. The smell reminded me of a holiday in India. I have acne-prone skin that was starting to experience some dryness as a result of long-term use of acne products. I unfortunately found this product to be too heavy/oily for my skin, and I experience more breakouts since starting to use it as a night cream (I use Alba's SPF 40 facial cream during the day, and I LOVE this product). That said, for people with dry skin, I bet this would be an amazing product, as it is very rich, and a little goes a long way. It also has a heavy floral scent that may not be for everyone. Light and natural, and such a good fragrance. My go-to Spring / Summer day / night cream. This works really well with my combination skin. It smells good (might be a little strong for those very sensitive to scent), hydrates my dry patches without being too greasy, and doesn't irritate my skin. Love, love it! Well, with all the beauty products I have tried, some very expensive, this is the best yet & I have sensitive skin. It is natural, feels wonderful, moist & beautiful on my skin. I can go bare face or use foundation immediately over it & it still looks fantastic. I do believe it has kept my skin looking younger than it would have been & I have been using this now for about 8 years or so. I highly recommend this product. Smell wonderful and hydrate well my dry skin. Unfortunately made my face red. Maybe it's not meant for sensitive skin. My all-time favourite day & night face cream. Texture - fragrance - effect, all excellent. The price is amazing too. And since I didn't find it locally I started ordering from Well - and don't look back. So easy, and comes within a week max to the door. I love the jasmine scent and how soft my face feels after applying it. I'm on my third jar with two more on the way! I think my crow's feet have shrunk!!! I love the texture of this cream, feels expensive when it is not really considering the amount you put on it will last forever! I am on my third jar. I will definitely continue using this product. It makes my face feel smooth and hydrated. It's not thick or greasy. Smell is lovely and light, cream is not too thick but skin feels smooth and soft after applying. Easily applied, absorbs well, but I find the scent too strong. It's vegan. What more can I ask for? I do like this moisturizer . It absorbs quickly , does not feel heavy and I like the smell. This stuff is awesome! It's a nice scent although not in my preference range but who cares when this hydrates and nourishes so well! I found it to be sticky and I did not care for the scent . I really enjoy this moisturizer. It's got a nice scent, it's super creamy and luxurious! It definitely gets rid of my dry skin. It works amazing under make up! It's also a great night cream and makes your skin super soft. I just don't like the jar packaging. I wish it was in a pump or a tube you could squeeze the product out of. I am almost out of the jar I bought just a few weeks ago - because I love this cream so much! Great texture. The jasmine smell is stronger at first, but then is less noticeable. I like the smell, and am someone who does not enjoy heavily fragranced products. This is just at the limit for me. The reason I am running out so quickly is that I am using this face cream as a body cream as well. I find it soothes my skin's dry itchiness - which many creams made for this specific purpose do not. So my rating is a strong 5. I must admit I am an Alba fan. I have been using their facial cleanser and moisturizer for 2 years now and I wouldn't change. I have sensitive and dry skin and this product is perfect for me. Never greasy feeling. I put facial sunscreen on over top and still don't feel greasy. I have used the green tea and aloe moisturizer too and it was great but this moisturizer is best for my drying-as-I-get-older skin!! I am sorry but I do not like the fragrace . I LOVE this product. It is not greasy, doesn't feel heavy on your face and has a light, lovely fragrance (not overwhelming). I use this year round, day and night. I strongly recommend this product! My mom bought this as a night cream and was so happy with it that I had to try it too. Her skin is dry and mine is combination, works great for both of us! I'm not crazy about the scent but I can live with it. My face felt so smooth after trying it just once. I'm currently using the green tea and aloe one but will switch to this one once it runs out! Amazing! I love this moisturizer. It smells like jasmine!!!! That alone makes me love it, but it also moisturizes very well, is all natural, non-greasy, and great for day and night. It's not only for extremely dry skin - my husband and I both use this, his skin is on the oilier side, and mine is dry but it works great for both of us. Did I mention the fragrance?! I have sensitive acne prone skin that gets very flaky and dry. Ever since I started using this moisturizer my face has felt so supple and smooth. I don't have any more flaking skin, it's incredible! I've never found a moisturizer that could get rid of the dryness until now. It's oil-free, smells so good and is a nice light gel-like texture, never greasy. I think I've finally found MY moisturizer! This is an amazing product!!! Im so glad I bought it! This cream will give your skin ultra hydration and radiance...this is coming from someone who has dry skin, especially in the winter, and someone who breaks out easily too. This cream is absorbs fast and will not break out your skin. Use it in the morning for all day hydration and a barrier against free radicals. Also great before applying any make-up foundation. as someone with ULTRA dry/dehydrated skin, i completely recommend this face cream. it smells yummy and while some may find it greasy, those who *know* dry skin will totally appreciate it.